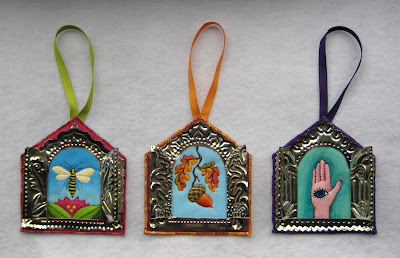 3" x 3", 3" x 3"
My sister Deb wanted to make a Fiesta Ornament before she went home, so she pulled out my designs and sat down and began to paint. 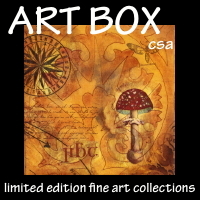 Deb is an altered art/mixed media artist, she uses paint in her art a lot but not the way I do. She started several designs and was unhappy with her results and said she wanted to watch me paint. 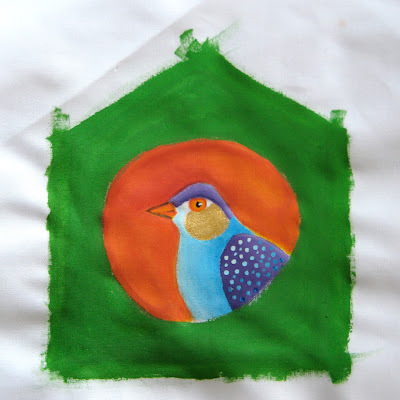 We each pulled out a bird design to paint and I walked her through the steps of mixing the paint in gradations and painting the different parts of the bird painting solid areas, gradations, glazing and adding details. This is Deb's bird after the lesson. What a difference from her first, Pretty darn good, huh? 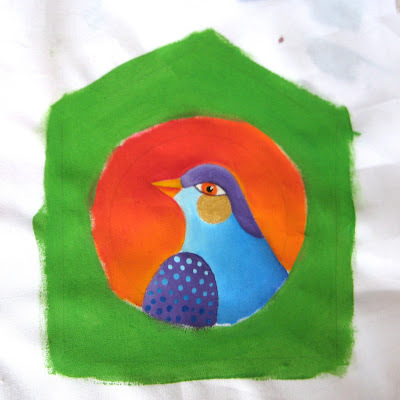 This is the bird I painted for the lesson. 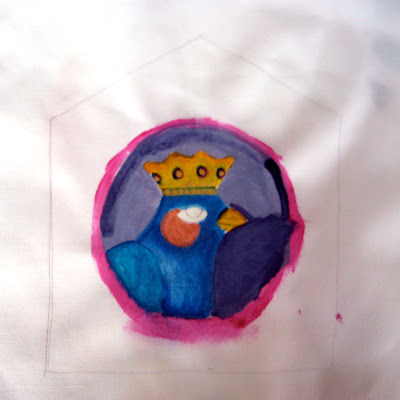 Then she painted a few more on her own and took them through the final steps of quilting, sewing the metal and embossing it. 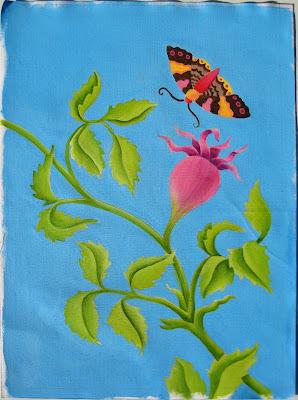 This painting is 6" x 8", pretty close to the size shown here. 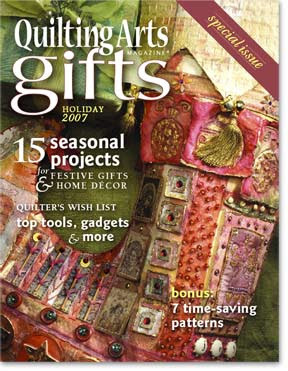 The new Quilting Arts is out. 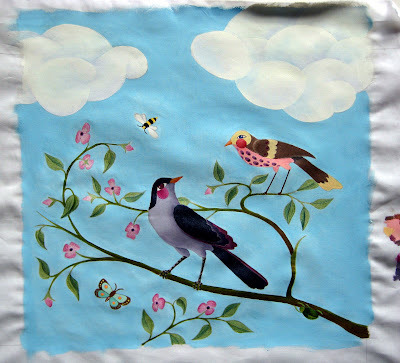 I love this cover, it is a detail from a beautiful quilt by Catherine Nicholls. This issue has some great work in it. First of all the feature is Pam Rubert, can't go wrong there. 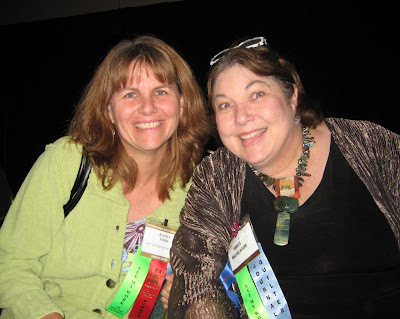 My good friends and fellow Gomez sisters Vickie Hallmark, Frances Holliday Alford and I, each have an article. 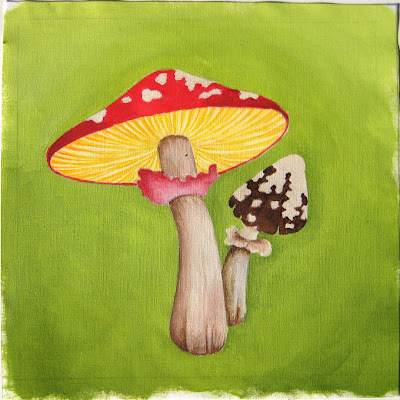 Also included is the work of German artist Sara Lechner who does wonders with a felting machine. She has a great blog. I woke up this morning to see snow flurries out my window. That really makes it feel like the holidays are here. (from Publishers Weekly) Set in 12th-century England, the narrative concerns the building of a cathedral in the fictional town of Kingsbridge. The ambitions of three men merge, conflict and collide through four decades during which social and political upheaval and the internal politics of the church affect the progress of the cathedral and the fortunes of the protagonists. 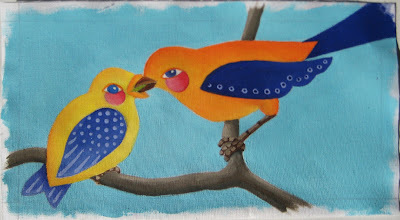 The story is so interesting to listen to I decided to keep painting and painted this little piece. I don't know why I always seem to be painting images that do not relate to my present time and location. 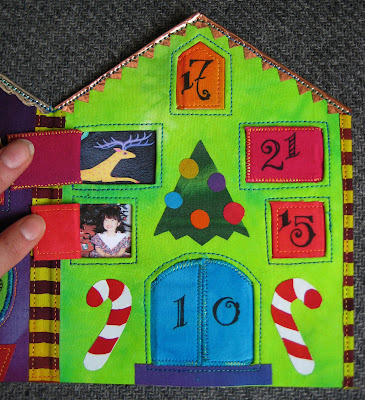 This is the Advent Calendar I designed for Quilting Arts Gifts. Here are a few detail pictures you can't see in the magazine. and details from quilts I have made. 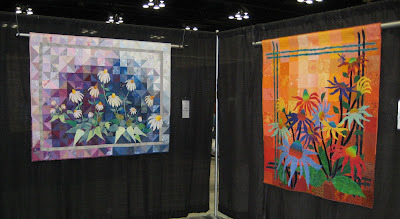 Two days at the International Quilt festival is never enough time to see everything, but I had my short list of priorities. One of my priorities was to make it to the Wonderfil booth. A textile artist can never have too much thread in my opinion. 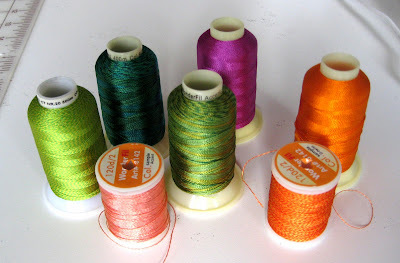 Wonderfil is a thread company based in Canada, and do they have some gorgeous thread. The stuff that caught my eye was this 40 wt rayon thread called Accent and D-twist. It is a slightly heavier weight and has a lovely sheen. If you wanted to draw attention to some stitching in your work, this would be the thread to use. I especially love the subtle variegation in the greens. Amongst many other projects in the works the Silver Belle progresses. 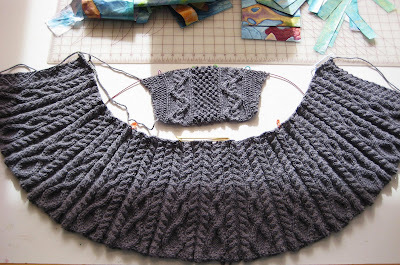 The peplum is done and I have begun a sleeve. My son has a long appointment today at the orthodontist so I should make some good progress on that sleeve. If you live in the mid west and have not gone to the Greater Chicago Quilt Exposition, you should. It is a great show with some fantastic special exhibits. 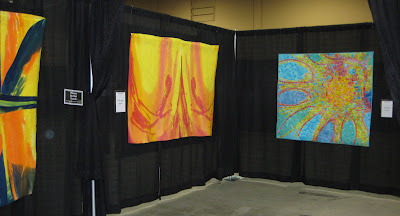 It is predominantly art quilts. You will see lots of quilts like this fabulous Susan Shie quilt in the fiber Renaissance exhibit. I went on thursday and the attendance was pretty low, I am not sure why this is; time of year, not enough people know about the show? I am worried it will go away if things don't pick up. This is the Pressing Matters Exhibit by the Chicago School of Fusing. 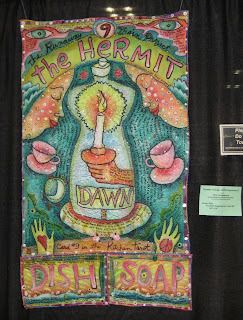 Fiber Renaissance is a great exhibit with lots of quilts from names you would recognize. 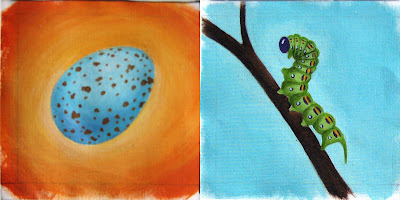 Here are several pieces by Pamela Allen with a Susan Shie piece on the end. 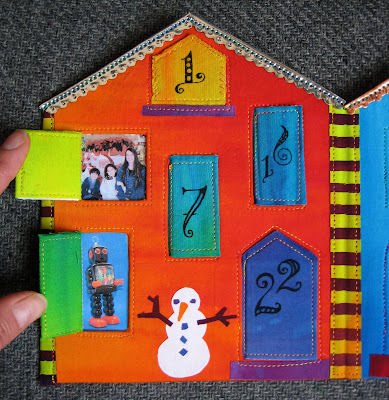 Where else can you see 20 of Robbi Joy Eklow's colorful quilts in one place! 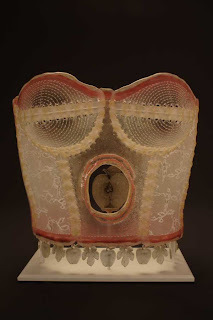 This is a fantastic special exhibit showing the work of Australian artist Gloria Loughman. Her work is stunningly beautiful. 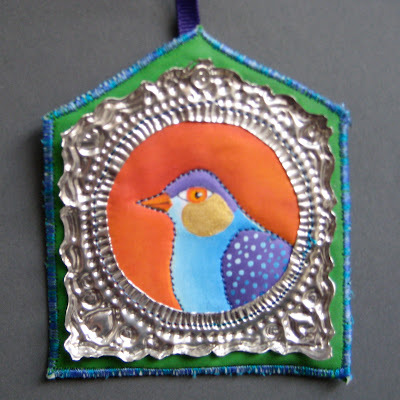 She combines traditional piecing with art quilting flawlessly. This is probably a rare opportunity to see this many of her quilts together in the states. 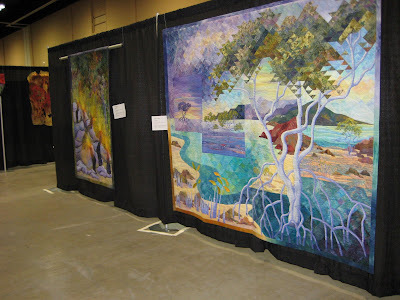 Another exhibit I really liked was by Rose Hughes, some how I did not get a photo of her quilts, they are beautiful. Check out her website to see her lovely landscapes. There are several more exhibits that should not be missed but you will have to go to the show to see them. Earlier this year I was extremely honored to join the talented faculty of the prestigious Chicago School of Fusing as an adjunct professor of special studies. As a member of the faculty I will have the privilege of joining them in a special exhibit at the Greater Chicago Quilt Exposition Thursday November 8 - Sunday November 11. The Faculty of the Chicago School of Fusing returns with new, exciting compositions featuring the work of Frieda Anderson, Anne Lullie, Emily Parson, Ann Fahl, Judy Coates Perez and Laura Wasilowski. 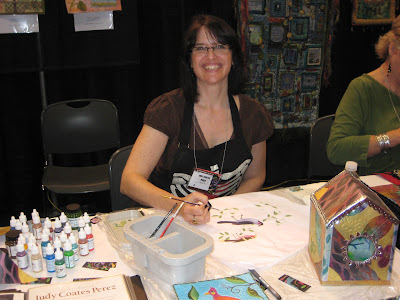 Each artist dyes her own fabrics, and has created her original designs using fusing as the construction technique. In addition to creating beautiful quilts and teaching at the Chicago School of Fusing, the faculty has also participated in challenging sporting events as members of The Iron Maidens. Press On, Chicago Fuse! 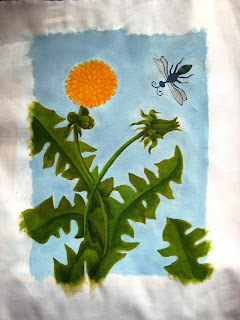 Not generally known as a fuser, I do use fusible web in various ways. 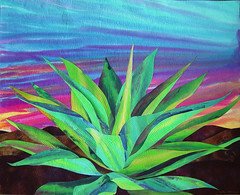 Sometimes my fusing may be hidden inside the quilt or used on the back during construction, other times it is used in the traditional Chicago School of fusing style as shown in the Agave above. 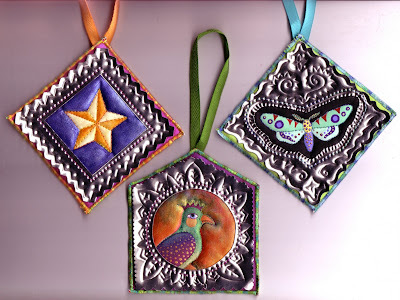 Now that you have all rushed out to pick up your copies of Quilting Arts gifts, I can show you all the ornaments that I made that did not fit in the magazine. These were so fun to make. I made 19 while I was designing them to be used with the article, I kept getting more ideas I wanted to try. The nice thing about this project is that even the really simple designs like the square, star and heart look nice. 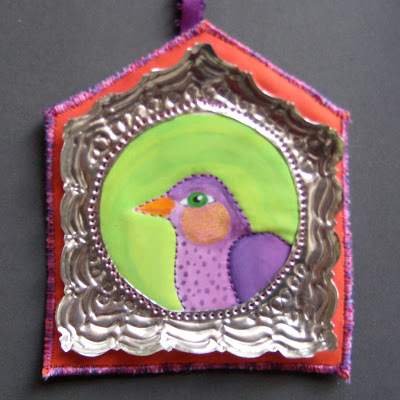 You don't have to be a skilled painter to make a fancy looking ornament. 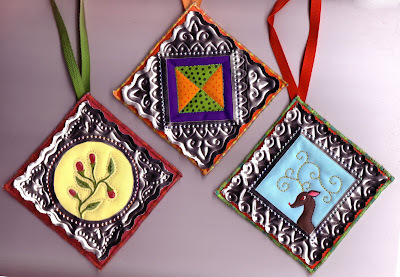 I think these can go beyond holiday decorations and be ornaments to hang on the wall year round. But they do look awfully pretty on the tree reflecting the colored lights. These ones have little doors that are folded open. Some of you may be worried about sewing metal on your sewing machine, but I can assure you, if your sewing machine will sew through a couple layers of denim jeans material, it can sew through this. Any of the higher end name machines should not have a problem with it. This is pewter craft metal, it is very soft. 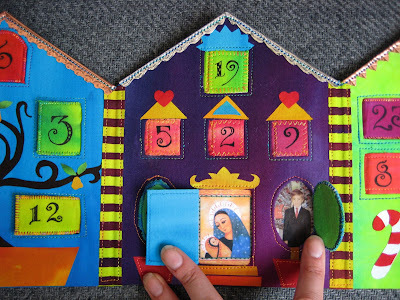 These are cut with decorative craft scissors made for paper. 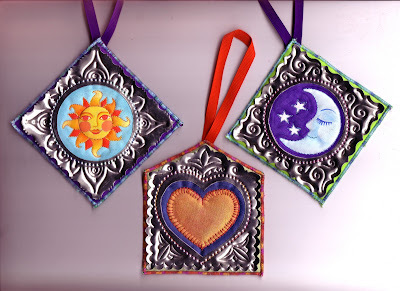 If you want to make these you can find the directions in the Quilting Arts Gifts issue. If you can't find it at your local magazine stand, click on one of the links in my sidebar. What a blast, I look forward to going to festival in Houston every year. 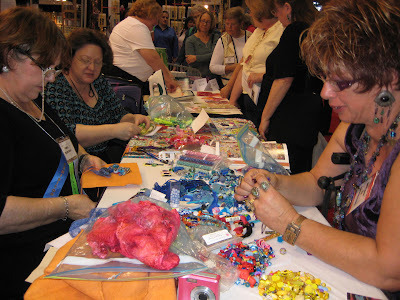 Not only to see the quilts in the show, get some good stash from vendors, but most importantly connect with friends, old and new. 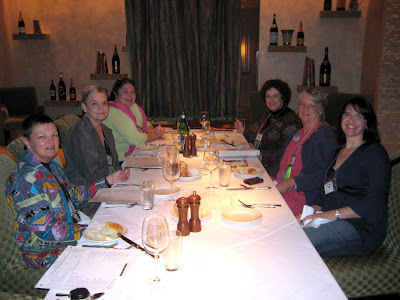 from the left Paula Chung, Rachel Perris, Frances Holliday Alford, Leslie Jenison, Jamie Fingal and Me. Kathy York and Frances' group quilt Kiwi and Fuscia meet for Mojitos won second place in group quilts, and Kathy's quilt Vertigo won second place in Art Whimsical. One of the best parts about doing Open studios for me is getting to meet people and answer any questions they may have about my work and painting fabric. People who drop by also get the opportunity to pick up and fondle the artwork laying on the table. Here's Frances, Jamie and I working away at the tables in Open Studios. It was all such a great time and went too fast. Especially since I left Houston at the crack of dawn Saturday to get home to Chicago and go to SOFA with my other good friends Vickie and Julie. SOFA was great, but I have to say after only 4 hours of sleep the night before and two previous nights of hardly any sleep, I probably was not in the best condition to really enjoy the show. There was a lot more glass this year. It pretty much dominated the show. 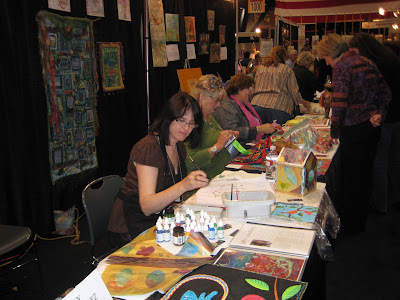 Unfortunately I did not see as much fiber/textile/mixed media this year as last. I loved seeing the work of Susan Taylor Glasgow up close and get a chance to talk with her. I admire the way she incorporates her background in dressmaking into sewing with glass, creating iconic images of womens work and homemaking. 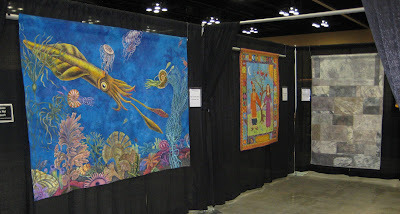 There were a few art quilts by some big names but surprisingly they were older pieces of work. Jane Sauer Gallery is always fabulous if you click on this link you will see all the incredible work they were exhibiting in Chicago. It looks like they did pretty well at the show cause quite a few pieces are marked sold on the website. 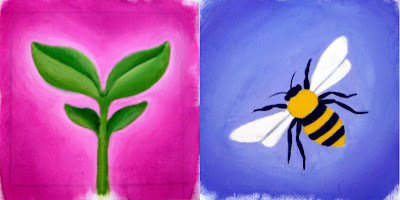 All 3 pieces by Jan Hopkins sold, I adore her work. 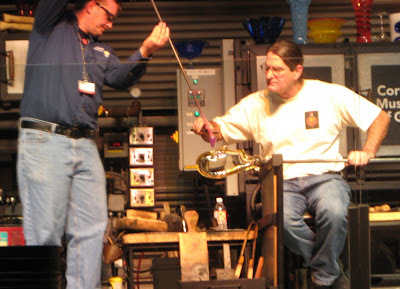 After walking the show floor we sat down and watched a glass blowing demonstration at the Corning Museum of Glass traveling road show with Richard Jolley.